“Use of acupuncture has been percolating for quite a while and it’s now becoming much more mainstream in medicine,” said Dr. Houman Danesh, director of integrative pain management at Mt. Sinai Hospital in New York. So mainstream in fact, that it’s one of the few so-called “complimentary” or alternative medicine approaches covered by most health insurance plans. Even the military uses auricular acupuncture, a form of acupuncture that involves gently inserting small needles into various places on the ear that correspond with pain points elsewhere on the body. Research studies consistently show that acupuncture can be an effective form of pain management, with some studies finding it even more effective than pain-relieving drugs or surgery. But exactly how it works remains somewhat of a mystery, Danesh admits. 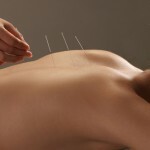 In theory, acupuncture stimulates the body’s meridian points. By easing pressure on these energy-carrying channels, ancient Chinese physicians believed the needles corrected the body’s imbalances by allowing energy or “chi” to flow more freely. Although traditional Western medicine remains skeptical about the idea of chi, Danesh said that many of the meridian points happen to coincide with trigger points, spots on the body where pain radiates away from the center when pressed. “Trigger points are widely accepted in modern medicine and one thought is that acupuncture may ease the stress on trigger points thereby lessening pain in that area,” he said. Meridian points also track closely with major nerve centers, Danesh said. It could be that the needles stimulate the nerves, causing them to release feel-good chemicals known as endorphins. People in pain often have low levels of endorphins, Danesh pointed out, and a release of those endorphins can suppress the sensation of pain. There are still plenty of Acupuncture skeptics who believe that any pain relief acupuncture offers is strictly psychological. But Danesh said he doesn’t care why it works, so long as it works. “I’ve had lots of skeptics come in for treatment and when they get better, they believe,” he said. Chronic pain is one of the most serious health problems in the U.S., affecting an estimated 100 million Americans, according to a 2011 Institute of Medicine report. Nearly 90 percent of respondents to an IOM survey said they coped with some level of pain on a daily basis. Today’s ABC News Health tweet chat will discuss chronic pain and the best way to manage it. Chat moderator Dr. Richard Besser, ABC News chief health and medical editor, will host the conversation featuring experts, researchers and people experiencing pain. Are you coping with an achy back, a bum knee or some other source of chronic pain? If so, come share your story with us and get some insight on how to manage your condition. Even if you’re a Twitter novice, joining the conversation is simple. Here’s how.